51. Managers: Getting It Done,Or Your Gift For Mine? On a stopover in Manila a while back, I wandered into a bookshop, looking for something that could give me a fix on "the" cultural mindset of the Philippines. This is a country with which I have had only brief contact. It was a silly aim, like picking up one of those books with a title like "Inside China" or "Understanding Australia, the Lucky Country" or "Secrets of the Roman Empire". What you always get is a caricature, an accident of some writer's meetings and prejudices, even if it is a pretty caricature. But probably that's all we get out of life anyway. You have to start somewhere. In this case, I picked up a volume called "Becoming a Guru", which turned out to be an elite insider's wry view of administration in the Philippines. His core theme was the pervasive failure of "implementation" in the Philippines, as opposed to grand plans and announcements. The author was one Dr Ramon Katigbak, whom I thought of writing to in order to probe a little more deeply. Unfortunately, he had just passed away. I wrote my unaddressed letter anyway, with a narrative seeping out that had less to do with the Philippines directly than with the cussedness of human management generally - a favourite personal topic that if gifted with an ounce of common sense, I would have put aside years ago in favour of wine, women and song. Recently I found myself in Manila briefly, and picked up your book by accident. I bought it since a quick scan revealed strong resonances with my own PhD dissertation (though from a quite different field). Like your D.B.A., my own much less distinguished effort was produced rather late in life and reflected some real world experience. At first I thought the 'guru' in the title of your own book must be ironic, but realized later that you have a mischievous appreciation of human credulity. (So far from aspiring to guru status, my understanding of my own field seems to recede by the year, but maybe that is irrelevant to one's perceived market value...). My reason for writing this note is to pose a query, or perhaps offer a challenge. Your concern with implementation, as opposed to mere 'planning', is admirable, and I have to take your word for it that the implementation of your own plans has been generally effective. However, as I read through your monograph I gradually began to feel that you had left the mechanisms of implementation critically underspecified. Have I missed something? Let me try to clarify my own starting point a little. I once began in a research career with a grand plan to explain the cognitive processes of language generation, then ultimately decided that with the mere gift of one brief life I would hardly rate a comma in a footnote, and ambled off into the sunset. In fact I have wound up as an educator constantly teased by the challenges of teaching, often to people one would not conventionally describe as 'brilliant'. The occupation of teacher, in which I found myself by default, is not a trivial pastime. In pre-literate and semi-literate societies teaching had an exalted status (some of that may now survive in a few rather empty rituals of respect). In modern mass societies teaching is rarely associated with the best and the brightest. Indeed it is often done badly and accordingly attracts little true societal respect. For all that, the challenge of effective teaching remains as tantalizing as it ever was, and its mastery offers lessons beyond the classroom. A teacher is a special kind of manager. "Managing" another person's learning is only peripherally about command and control, and certainly not about self aggrandizement. Teaching is mostly about the extremely subtle art of getting students to organize and deploy their own resources in an effective way. However, subtlety is almost an oxymoron in the context of mass institutional education, and therein lies a teacher's dilemma, rarely comprehended by those in supposedly more elevated branches of the management forest. What is the point here of this exposition on teaching? Well, in fact the kind of subtlety known to gifted teachers is needed not only in school teaching. That is, the kind of civilization we want is probably one which is driven by personal enthusiasm rather than induced fear. Of course, fascism still has a large constituency. The uncounted graduates of business schools worldwide prefer not to see themselves as fascists. They will indeed parrot mantras about the importance of motivation, but when it comes down to office, factory and government practice what we usually see is a shabby resort to "public relations", spin, a.k.a. professional lying. Ultimately, that stuff is poison to motivation. Human beings are not entirely stupid all the time. Spin debases civilization. If you want a lesson in genuine motivation, find the gifted teachers. Management, as you note Dr Katigbak, is the process of getting things done, and generally seems to mean getting other people to do things in a productive way. The argument here is that good teaching makes a fine model for most kinds of management. Teaching is the process of getting people to extend and develop their ideas to the best of their potential, often against their own better judgement even if they have 'enrolled in a course' (since few people like to be discomforted by new knowledge). Back on the planet earth, self-named administrative managers have usually been a bane to my teaching management. From the perspective of a teacher, I have to say that the general style of educational managers in the seven countries where I have worked has been remarkably obstructive, and sometimes destructive. The negative influence of managers has grown from their disregard for, or incomprehension of teaching productivity and student learning productivity. My doctoral dissertation deals with this through a series of twenty case studies. Thus in practical terms it has often been necessary to subvert the intentions of the so-called executive class in order to achieve professional teaching productivity, and that of course not infrequently meant deceiving various levels of management in quite personal ways. What are our tools for bolting together the diverse agendas found within all institutions? You favour a narrative technique, which you rightly identify as a powerful management vehicle for explanation and persuasion. Controlled narrative can also be applied, post facto, to justifying a teacher's professional deceit for honourable purposes. I have attempted to illustrate that extensively in my thesis. The problem of course, is that a narrative process can also be applied to justify anything, up to and including pure evil. In fact, this is almost a normal state of affairs. The winners, as they say, get to write the histories. It is a dilemma of complex civilizations that the law can make scoundrels seem like benefactors, and good men into knaves as they navigate the treacherous currents of daily survival. Perhaps it would have been treading a little dangerously for you to offer Philippine narratives of deceit intended to subvert the rich and powerful, even with benign intentions, although something similar of course is just the theme of many a TV movie. Those administrative managers who can put aside their hubris might also learn sometimes from teachers. The teacher who cannot manage the implementation of his curriculum cannot teach at all. It is true that teaching 'implementation' frequently takes the form of teacher presentation and student regurgitation, which keeps the diplomas rolling out and makes administrators happy. We can probably agree that a such a zombie outcome represents neither true teaching nor true learning. In the same way executives, employees or citizens who become merely skilled at mimicking rules and customs without insight or conviction are not going to grow a company or a country. For thirty-four years I have been either teaching English language, or training teachers to teach, or teaching about language (linguistics). As a practical problem I am often faced with classes of young people who have lost much of their faith in their ability to learn. If you think about it, that is not so different from the clock-watching employees in organizations, whether senior executives or the most humble workers, who have lost faith in their ability to make a worthwhile contribution to the enterprise. Nor is it so different from the peoples of a country who note that the wider world holds them in low regard as a 'developing country', and have lost most faith in their power to bring about systemic change for the better; (at best they may find solace and self-respect in their own families). There is hope. Many years ago I made a discovery about 'implementation' as a teacher. Reading your book, I therefore wonder how successfully it might be applied at a wider societal level in companies and governments. That discovery came out of my early undergraduate work in social anthropology. Here is the crux of student resistance to learning: a) primary school age children are a joy to teach, forever curious and asking questions; b) by about 14 years of age they have had the joyful curiosity beaten out of them, sometimes physically, more often by the corrosive depersonalization of mass education, the scolding of teachers who are afraid to look stupid, and the forced feeding from curriculums that 'have to be gotten through'. By 18 most of these students are reduced to sullen silence, or sly busy work that makes them appear to be 'good students', but leaves no trace on their convictions. Again, in this paradigm you may find some trace of the 'grown up' situation amongst employees in government and industry. The 'discovery' I made is a very old technique indeed. You could call it 'reciprocation'. Imagine meeting a man who, without asking, gave you gifts of great value. At first you might be pleased, though a little embarrassed since you had nothing of obvious value to offer him in return. However, this man had no interest in whatever humble things you might proffer anyway, but each day insisted on giving you new gifts. Shortly you would probably begin to resent the fellow, and wonder if you were merely a vehicle for promoting his glory (yes, there are echoes with religion in this business too). The sullen students that I meet have had the gift of education shoved down their throats for most of their short lives. They are held captive to receive this gift, and are considered ingrates if they question it at all. The human spirit would be entirely dead if they were not simmering with revolt. Being cast as a mendicant is the healthiest thing that can happen to an arrogant bringer of gifts. Monks picked up on this stuff long ago. The great attraction for me of teaching in foreign cultures is that I am reduced to complete stupidity. Arriving as a teacher in central China, I walked the streets almost as a ghost. The babble of voices around me was incomprehensible, the streets were lined with signage that meant nothing to me. In my place of work, things happened without warning or explanation, since of course everyone (except me) knew that they were going to happen. For a teacher, this was the most fortunate of situations. My very survival and sanity depended upon help from my students. I attempted their barbarous language and got greeted with gales of laughter. I needed the simplest of things from a chemist shop or a hardware store. The shop assistants would gawk in incomprehension, until I enlisted the help of three giggling girls who yesterday couldn't manage a simple English sentence, but who suddenly became persons of ultimate authority. This description may sound trivial, yet again and again my own ignorance has been the key to transforming educational environments. Again and again I find that students who are allowed to offer something of value to me, the teacher, are suddenly open again to enthusiastic learning. The universe is back in balance. My undergraduate studies co-majored in the study of myths, from bible stories, to tales from the jungles of Borneo, to the worldwide oral traditions that have underpinned human cultures from time immemorial. My professor in Victoria University of Wellington, New Zealand, was a Dutch anthropologist, Jan Pouwer, raised in the European neo Marxist froth of post-WW2, and the ideas of the French structuralist, Claude Levi Strauss. I'm a natural skeptic, and the neat Hegelian thesis-antithesis-synthesis designs that this school found in all myths left me a bit dubious. The Levi-Strauss argument was that myth, passed from person to person across generations, becomes stripped of any personal contribution, and only retains those patterns which are universal to human thought and action. It is a seductive argument, but probably also open to much challenge. It did however sensitize me to the exchange relationships that permeate all human cultures (their permutations are infinite), and to the idea that exchange patterns fulfill some deep human psychological need. The reciprocation which I have found so powerful in teaching relationships with students fits naturally into this wider paradigm. Dr Katigbak, you are accustomed to dealing with societies on the level of grand schemas. You could argue that institutions, companies and governments are indeed involved in intricate exchange relationships with individual citizens. My students are constantly reminded of their 'duty to society' by school leaders, and so on. It is water off a duck's back. A very few care greatly about the 'future of humanity', or follow what we choose to call world affairs. A slightly larger number manage to care about their country, more of them again about their neighbourhood, and nearly everyone about their family. When we think about reciprocation as an engine to action, and a balm to our sense of social balance, as a teacher (in my case), or an institutional planner (in your case) we must always remember to ask if the deal we are offering, the exchange of values, skills or information, has psychological reality for the people we are hoping to influence. It is fatally easy to be careless about this. When I forget, my restless students quickly bring me down to earth, and once again I redeem their sympathy and care by enlisting their help. That is much harder if you work in an air conditioned office, and the people you want to engage are 'out there' somewhere in their millions. So that is the challenge I intended to put to you. Amongst all those whose lives you hoped to improve, how many felt that they were able to offer something of value in return, and how often? Ramon K. Katigbak, Ph.D., D.B.A. 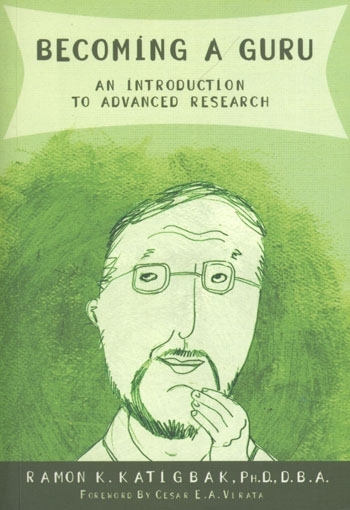 (2008) Becoming a Guru - Introduction to Advanced Research. Manila: Anvil Publishing Inc.